It is yet another EUR currency pair presenting a trading opportunity for the upcoming week. 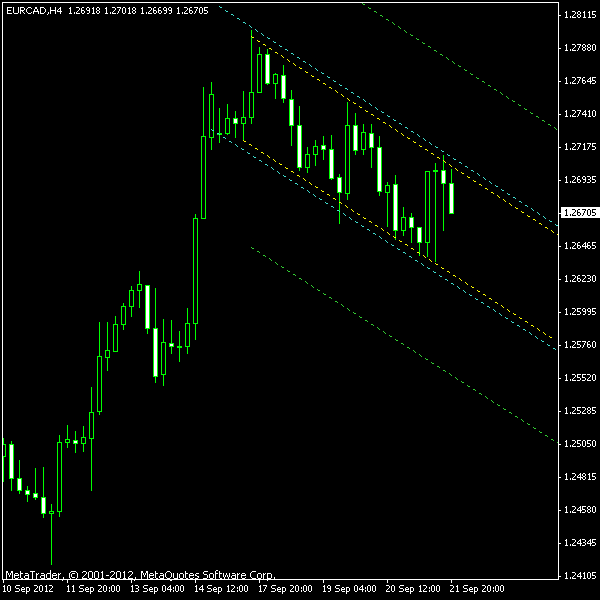 This time it is EUR/CAD, which is showing a fully matured descending channel on the 4-hour chart. The pattern has more than enough touches on both upper and lower trendlines. The parallels are not ideal and the edges are rather rough, but, nevertheless, it definitely qualifies as a real descending channel. Breakout in both directions can be expected. Seeing as this channel is a continuation pattern for a preceding uptrend, the bullish breakout is more likely to occur. Unfortunately it will have a declining target level, which reduces the profit potential of a long position. For a bearish breakout, such target line would provide an gradually increasing take-profit distance. You can also download my MetaTrader 4 chart template for this EUR/CAD pattern. Update 2012-09-25: Long position entry triggered at 1.26743. Stop-loss set to 1.26262, initial take-profit — at 1.27452. 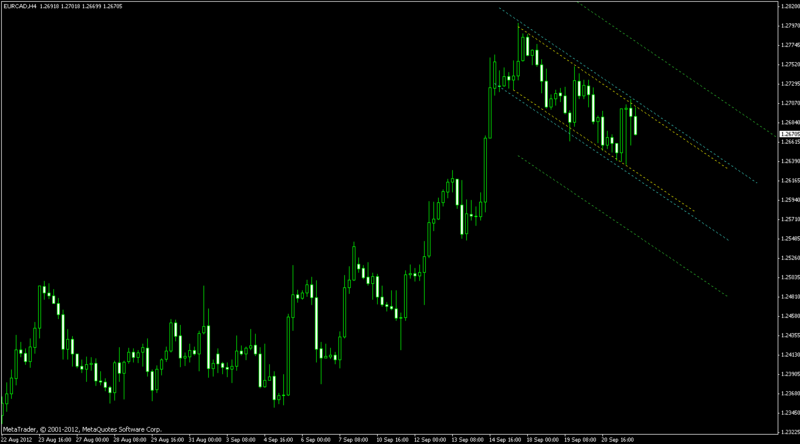 Update 2012-09-26: Position closed with a loss as the price returned into the channel and triggered the stop-loss. If you have any questions or comments regarding this EUR/CAD chart pattern, please feel free to reply via the form below.